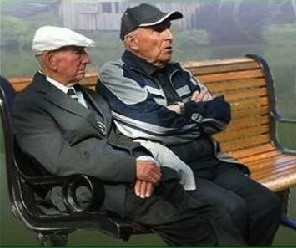 A familiar old man sat down next to me on my favorite park bench yesterday. He smiled and crushed out his cigar beneath his open-toed right sandal. “I just want you to walk with Oscar.” He looked around and gave a shrill whistle that could have cracked the marble altar in St. Peter’s Cathedral.” Then, in a flash, there appeared a big hairy St. Bernard dog with a face that looked much like Joe Pesci. “What is that?” I said, backing away. Oscar slobbered all over my Florsheim shoes and then glared at me. “We’re not going to have a problem here, are we, pal?” he said in a Joe Pesci voice. “Enough!” God bellowed and the ground beneath the bench shook and the sky darkened just above my head. “And if I refuse?” I said, folding my arms over my chest in a defiant manner. Again God’s eyes turned black and the dark cloud over my head burst and showered me with a hard, stinging rain. Oscar sniffed the ground, found a scent he liked, and squatted over a patch of green grass. He showed me every one of his teeth and grunted loudly. “Bingo again, Pal,” he said. Global warming is in the news again. Now one noted German Professor of Gastronomy, Maxwell Von Schmelling, said he has discovered the cause of all that gas. “This has got to stop or vee will all be asphyxiated!” Prof. Schmelling warned. According to the good professor, the human species is mostly at fault. I mean, how much gas can be blamed on shrimp or squid? So we humans, he said, must limit the amount of flatulence we produce on a daily basis, or die. According to Schmelling, the Greeks, Russians, and French are the worst offenders, followed by the Irish due to their consumption of large amounts of dark beers. Although the English never admit to passing gas, Prof. Schmelling’s findings prove that they do. It’s just that the human ear is incapable of hearing their emissions. However, many English Setters and a certain bred of sheep in Scotland reportedly have gone deaf due to the extremely high pitch of gas coming from England’s populace. Schmelling attributed this to the English having such tight asses. Adolph Hitler’s gas, he admitted, was so frequent and so foul that 12 high-ranking Nazi generals surrendered to the Russians rather than spend one more day in the confines of Hitler’s underground bunker. Likewise, a few brave followers of Osama bin Laden have defected to the American side because they said the air in their cave was putrid. They said they asked their leader to put in a window or two, or even a small a/c unit, but he denied their request. Prof. Schmelling demanded that a law be passed immediately to limit the amount of gas each human being can expel before being reprimanded and flogged, or sent to a gas chamber. At one point during his speech in Berlin he became so furious with the doubting audience that he turned to the German Chancellor and shouted: “Mein Fuhrer! You must heed my words!” At this point, he was shackled and dragged away. Personally, I agree with the deranged professor. A law should be passed. Of course, old farts like me would be exempt because we no longer have control of our bodily or mental functions.